Pray21 is a simple, easy-to-implement guided prayer program for students and adult mentors to pray together and discover their place in the cause of Jesus Christ. Thousands of congregations are already using Pray21 to change the future of their church. 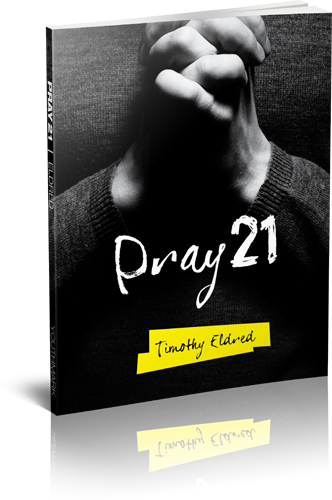 For 21 days a student and his or her adult mentor will read through Pray21. They will also connect in a variety of ways (phone, text, IM, social media and in-person meetings) and pray for and with one another. The Pray21 book inspires through quick introductory stories, guides participants deeper into Scripture and asks thought-provoking questions that lead students and mentors along in their prayer journey. Order. Visit pray21.com to order your Pray21 books. You'll need two books for each participating student, one for the student and one for their mentor. Plan. Familiarize yourself with the Pray21 Leader's Guide, and choose the implementation scenario that works best for your church. Make a plan, choose a start date, and begin preparations. Ask students to submit the names of potential mentors. 99% of the time students already have high-character adult mentors in mind. Promote. Share your heart and vision with students and with your congregation. Let them know that the time has come for us to start praying WITH one another and not just for one another. Execute. Get the books out and start praying! Unfortunately we live in a world where trust has been broken and every precaution must be taken to ensure the safety of all parties. Please adhere to your church's standards and policies for student/adult interactions. Many churches already have a Risk Management Policy in place, and if your church doesn't we recommend adopting one before launching Pray21 or any mentorship effort. Keep a record of all students and mentors participating. Keep parents "in the loop" — from the beginning and throughout Pray21. If meeting in person, ALWAYS do so in public places. Use text, phone and social media to check in with one another and pray. Consider doing this as a church-wide movement — "Praying WITH and for the Next Generation"
Consider incorporating this into three weeks of your youth program and have adult mentors come as well. Consider natural start times: Start of School year, Christmas break, New Year, After Easter, Before or After Mission/Retreat.